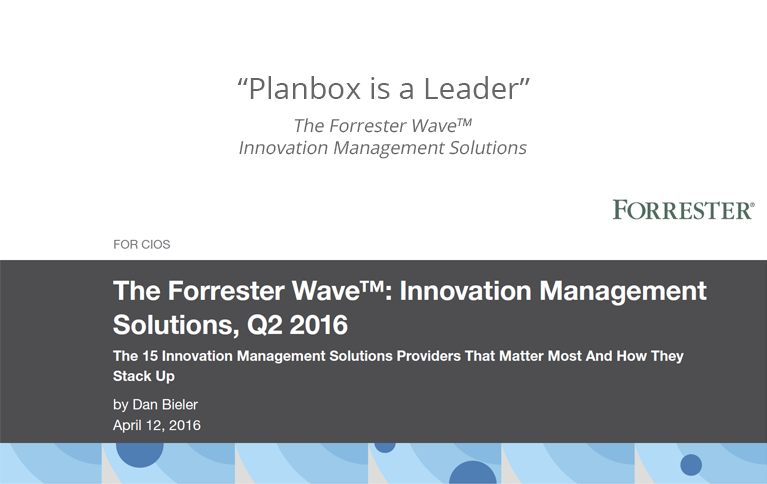 Planbox was among the select companies that Forrester invited to participate in its 2016 Forrester Wave evaluation, Innovation Management Solutions. In this evaluation, Planbox was cited as a Leader in Innovation Management. This ranking was based on a combination of the strength of Planbox strategy, the strength of the current offering and overall market presence. “Many businesses turn to innovation management solutions because innovation initiatives based on communication and collaboration tools like Google for Work, Jive, Slack, SharePoint or Quip have inherent limits for driving innovation. These tools support ongoing conversations, but do not offer the features to support workflow-driven idea management, let alone innovation consulting”. The top attributes cited for Planbox in this report included key areas such as: collaboration, front-end innovation and idea management work processes, back-end underlying governance processes and structures, incentives management/gamification, big data and analytics as well as customer experience strategy. Planbox is the pioneering provider of cloud-based Agile Work Innovation solutions – from creative ideas to winning projects. Our mission is to help organizations thrive by transforming the culture of agile work, continuous innovation and creativity across the entire organization. Our family of products include Collaborative Innovation Management, Team Decision Making, and Work Management applications. Planbox is designed to be the agile work innovation tool for everyone, built for companies and teams of all sizes. Planbox is trusted by some of the world’s most recognized brands including Bridgestone, CMHC, Panama Canal Authority, Sempra Energy, Willis Towers Watson and Verizon with millions of internal and external users. To learn more, visit: www.planbox.com and unleash your innovation butterfly.